This round sphere is generally called Orb. 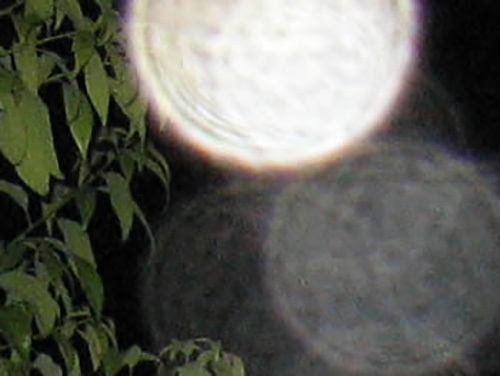 There are several kinds of Orbs informed, but the most often reported is a small light source defocusing. The matters in the back are well focused and because of this, you may not understand why we pick up defocusing. However because back ground is clearly focused, the light source in near side, just in front of the lens for example, is out focused. So what is this small light source? 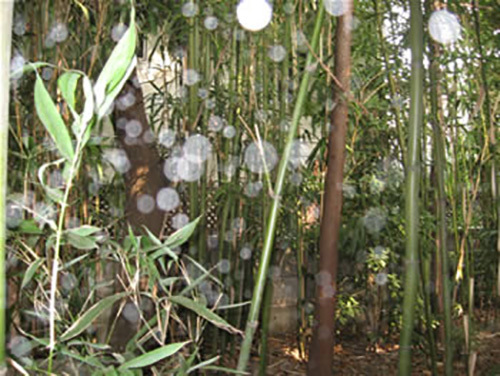 In many cases, they are dust floating in the air. 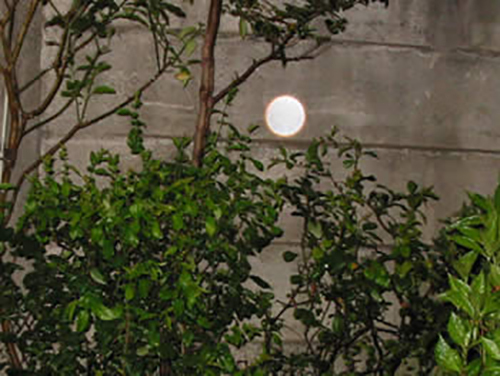 When lighten by any strong beam, the dust become the small light source, and when taken by photo focused on the far side, these dust in the air become unfocused then blur and appear like orbs in the photo. Please take a look of sequential photographs. 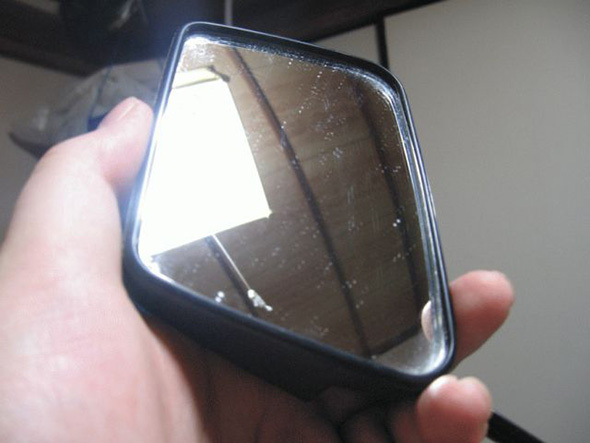 This is a mirror with dust. We took photo of mirror focusing to the matters reflected in it. 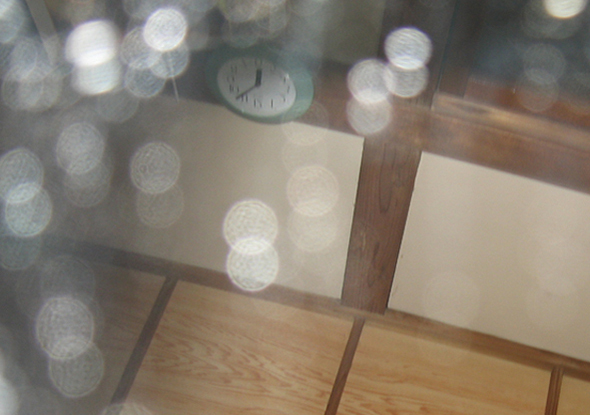 As you can see, as the mirror approach the camera lens, the dust turn into Orb-like- shapes. The technique is simple. All you need is a small light source defocusing and it does not have to be some dust in the air. 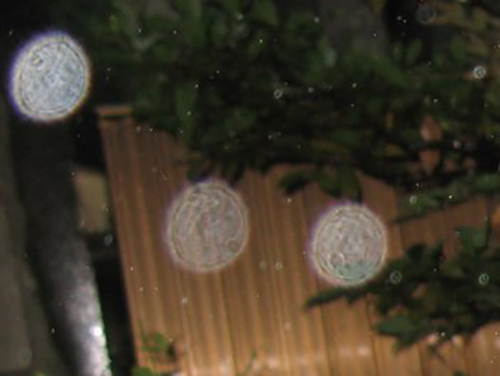 “Rain drops” (Upper first and second photo),”Small water drops adhered on lens”, (Upper third photo), light far away when the focus is put on the near object works as well. So before you call them an Orb and a spiritual phenomenon, you should treat them with reliable attitude. In addition to this, sometimes light from the source outside the picture plane refract in the lens and make an image and this also treated as Orb. 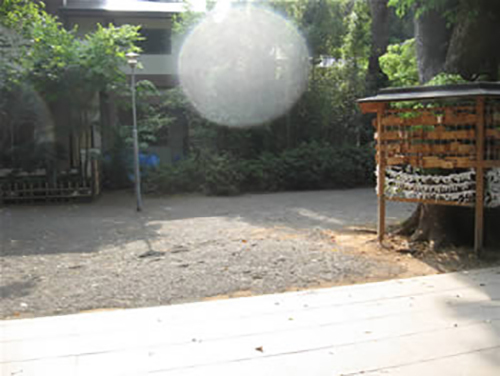 We have been describing orb, sometimes called Tamayura in Japan, as small light sources out focused. However, some would not understand this mechanism even though we show these reproduced photos. These people sometimes give you “moving orb” as the evidence for “real orb” saying the movement is just like living thing and these cannot be dusts. They are little too quick to decide, “It cannot be dusts”. They at least verify how dust move. 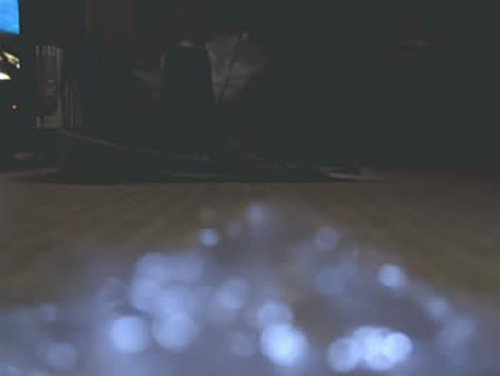 It is amazing how simple dust moves in a video clip. 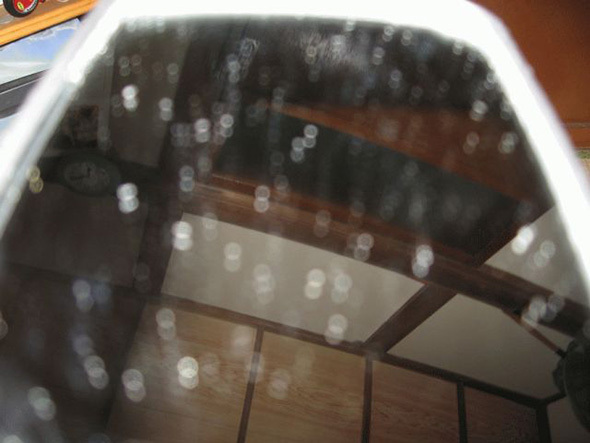 Below is a video clip we took showing dust that looks like some Orbs. It is moving up, down and sides, moving around. As soon as the video starts, orb moves to right and disappears. Then dust appears from right and move to left. Here is a reproduced photo of the body becaming semi lucent. 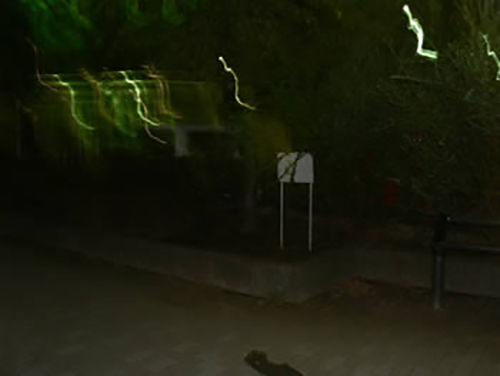 Because this type of ghost photo is often given together with the photo of orb, we will describe it into the details. As you all know, photo is a mean to cut out a moment and camera is a device for it. Then, how long is this “moment” actuary is? The “moment” that camera cut out is specifically the time between the shatter opens and closes. Take photograph means give light to the parts in camera where it record the light (film or CCD). The light is what camera is seeing at that moment. We need certain strength of light to record them to the recording part. In dark places, light is weak and therefore the time when shatter is open should be longer than when taken in a bright places. In case of compact cameras, which are widely used, cameras control the length of time when the shatters are open. 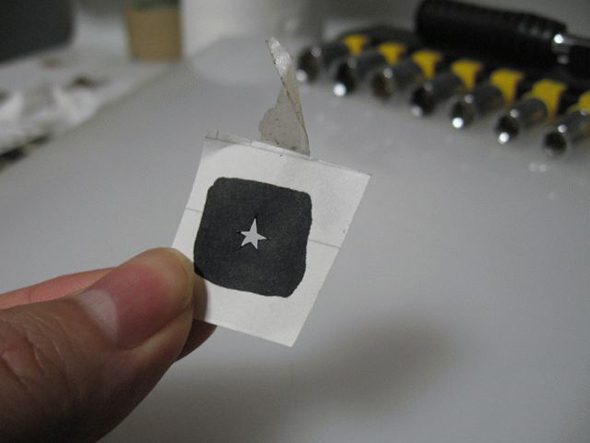 The user of camera, in most cases, does not recognize how much seconds his/her shatter is open. We have described”moment” of a camera likely to get longer in dark places. What will happen if a person who was the object of the photo moved during the “moment” that the shatter is open? Let us say shatter was open for two seconds, and then this one photo records the movement of one person during the moment of two seconds unintentionally. This is so called blurring. 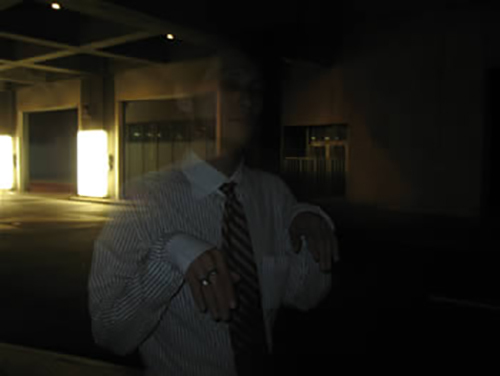 In dark places, blurring things appear thin in the photo. It is because the shorter the person is in a place, the light coming from the person gets weaker and weaker to be recorded in the photo. Let us set camera in a dark place in the night, and leave the shutter open for 3 minutes. 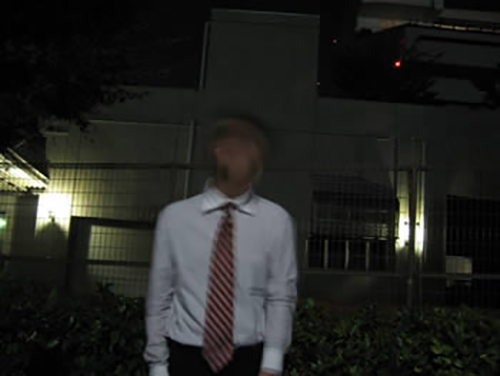 If a person runs through in front of the camera, the non-moving background may appear in the photo, but the running person would not. What if a person was standing for a while, and then starts to run while the shutter is open? This person is clearly recorded by the camera when he/she is standing, and then as one starts to run, this person disappears from the photo. 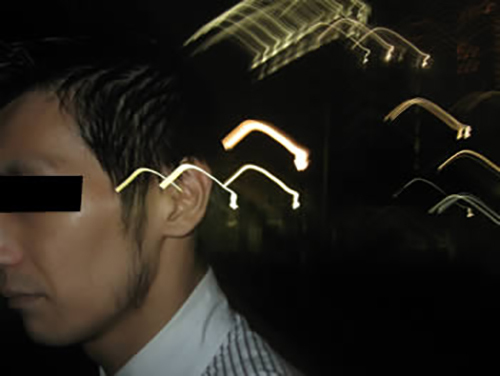 After the person is gone, the non-moving background is recorded over the figure of the person, which means the semi lucent person and the background appear on the same place of a photo. Looking at this photo, one might think the person is semi lucent because you can see the background as if through the person’s body. Same may occur to a part of person’s body, e.g. arms, legs and heads. 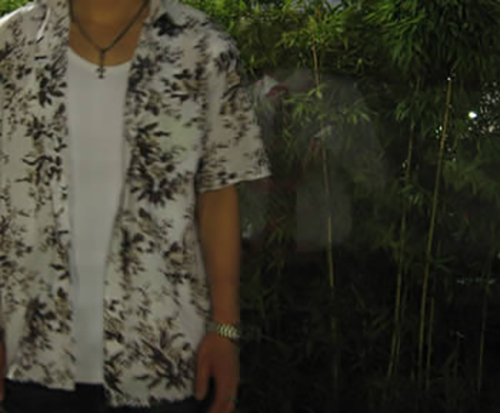 If one is wearing dark colored clothing, you can easily disappear on the photo, because dark colors do not reflect light. 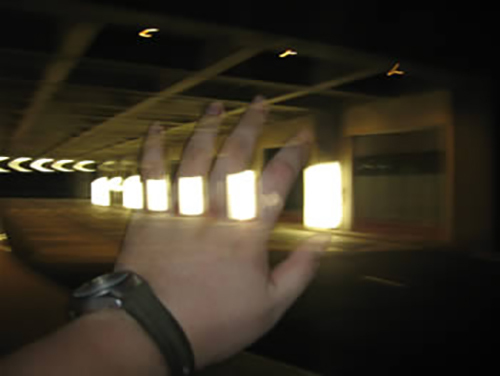 While the shutter is open and some strong light hit the moving person for a moment, that happens when one is in a flood of flashlight the other person used or one’s own flashlight light shorter than the time the shutter is open, the shape of person is recorded only when he/she is lighted and the non-moving background overlaps after this one is gone, causing he/she to appears semi lucent on the photo. Now we know that taking photo in a dark place often end up with a number of bizarre photos that human beings does not recognize by his/her own naked eyes. Of cause these are not ghost photos that you bring to psychics with terror, of curse. 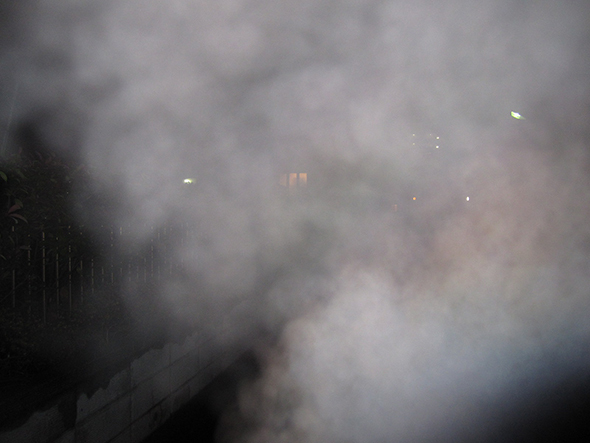 We suggest you to enjoy the bizarre effect of camera and photo taking in the night. 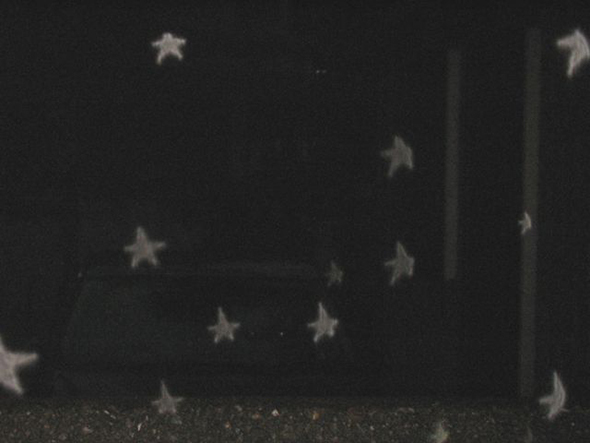 These are strange photos taken during our experiment. Please make an intelligent guess under which situation each picture is taken. We of cause did not make any composition. This is reproduction of photo that records some belt of light. As we have described at the section of translucent body, today’s cameras automatically open shutter for relatively long time in the dark place. Under this circumstances blurring are likely to occur. 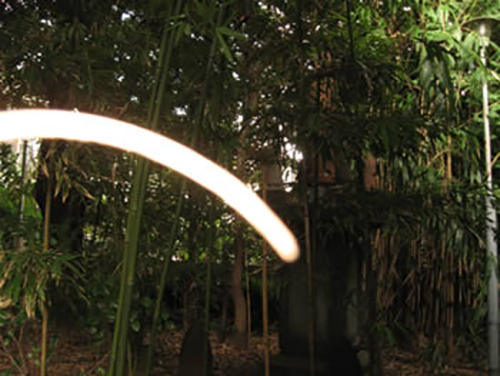 As we have described how a semi-lucent body picture is taken, blurring thing is unlikely to appear on photos. While the light itself, e.g. street lamps, would appear as it is without any problem. Let us say the shutter was open for one minutes. What will happen if a moving light, for example, a bicycle with light passes by the camera. If the light comes from a bicycle, then it moves several meters per second. 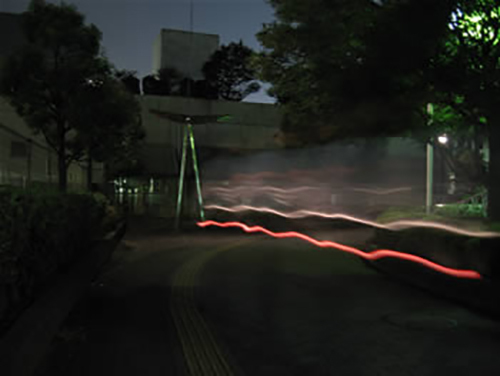 In the photo, the belt of the light appears with the length of meters that the bicycle moved. When you are holding camera in your hand, even if you are a professional photographer, you can not hold it still for a second and absolutely motionless. Naturally, camera moves and creates blurring. This is called camera shake. If you are an amateur who is not skilled with camera, your camera moves without noticing the possibility of camera shake. Then again photo comes out with blurring. When there are street lamp-post or windows of houses lighten in this photo, though the light may not move but the camera shakes and results some belt of light here. When this source of light belt is a fluorescent lamp, human eyes do not notice it but the light is blinking in a fast cycle. Under the dark circumstances like night time, this cycle cause long and broken belt of light because the shutter is open for a certain period of time and camera shake happens. This may happen on a photo together with semi-lucent body. The photo becomes very mysterious. Do not jump to the conclusion and think the photo records some spiritual event happened to you. This is only matter of photo techniques. 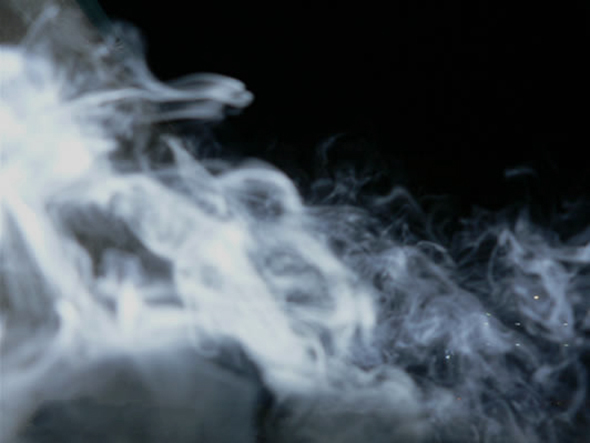 Photo below first is breath of the photographer, below second is smoke of cigarette, below third is exhaust gas of a car, all lighted up by flash lamp and appeared in the photo. Each has unique texture but all are much whiter than these seen by the naked human eyes. Especially in the case of breath of photographer, it is hard to see it in a dark place. And most of compact camera flashes automatically when it is dark, this kind of photo is taken without special intension of the photographers. 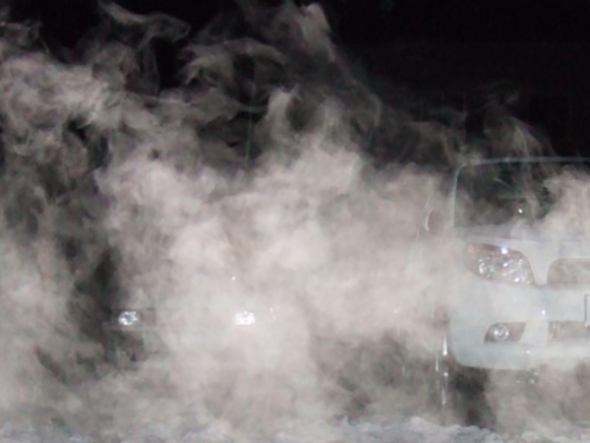 Breathe and exhaust gas of cars are clearly seen in the photo above, but without flash light, they hardly appear on the liquid crystal screen of digital camera. What are on the photos below are straps of camera. Colors are white, gray, beige from left to right. It is a finger on photo in the left. Middle and right are red rubber, but the color changes when taken by camera. Rubber again. We used pink rubber on left photo, yellow on middle and pink, yellow and red on the photo right. Above three photos, we tried thread, thinking possibility those piece of thread may stick to lens of camera. Color is red and green. 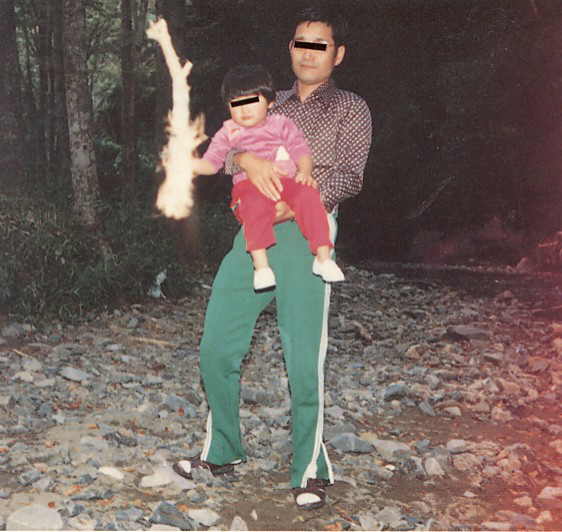 A consulter living in Ibaraki prefecture tells that this photo was taken when she was an infant. According consulter’s memory, she was holding a stone on the right hand. However something strange is shown in the photo. She wondered and has this photo appraised. According to Mr.Okubo, this is done by a stray ghost and this ghost wanted to do an impressive performance. 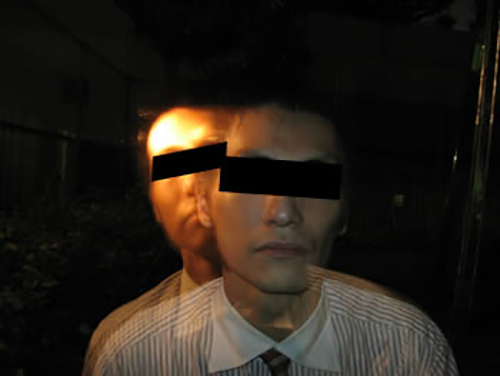 Photos above are reproduction of what Mr. Okubo says the performance of stray ghost. Materials used here are branch on left and middle and right is leaves. 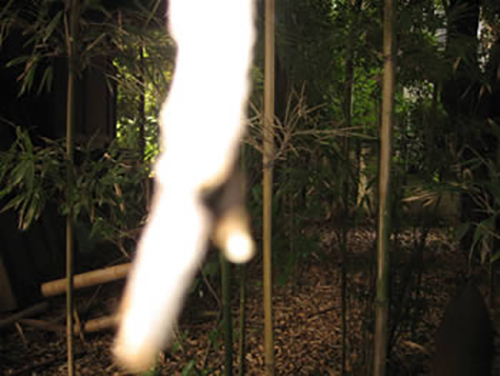 Our assumption was when the ghost photo was taken in the bush; branch or leaves dropped down from the upper part and reflected strong flush lights. Under the same circumstances, we succeeded to take about same reproduction photo. We believe it must have been a branch lighten by flush that was taken as ghost photo.